باتوجه‌به اهمیت یافتن جایگزین‌های مناسب برای پودرکاکائو، ترکیب شیمیایی، ویژگی‌های فیزیکوشیمیایی و عملکردی، خصوصیات فیزیکی و جریان‌پذیری (زاویۀ ریپوز، ضریب هاسنر و اندیس تراکم‌پذیری کار)، همچنین ویژگی‌های حرارتی، آنتی‌اکسیدانی و حسی آرد سویای برشته‌شده در فرایند حرارتی دانه‌های سویا در دمای 165 درجۀ سانتی‌گراد، در زمان‌های 4، 6، 8، 10 و 12 دقیقه بررسی شد. مقادیر عناصر کلسیم، سدیم، آهن، روی، منگنز، مس و منیزیم با اعمال فرایند برشته‌کردن در نمونه‌ها افزایش نشان داد. با افزایش زمان برشته‌کردن، زاویۀ ریپوز در نمونه‌ها کاهش نشان داد. ضریب هاسنر و اندیس تراکم‌پذیری کار به‌ترتیب در نمونۀ آرد خام سویا 1/51 و 33/33 بود و پس از برشته‌کردن به 1/40 و 28/73 کاهش یافت. پژوهش نشان داد آرد سویا دارای جریان‌پذیری نسبتاً ضعیفی است و در محدودۀ پودرهای روان قرار نمی‌گیرد. پارامتر رنگی L* که به‌عنوان شاخص دما ـ زمان در فرایند برشته‌کردن مواد غذایی (نظیر قهوه و کاکائو) مورداستفاده قرار می‌گیرد، با افزایش زمان کاهش یافت. 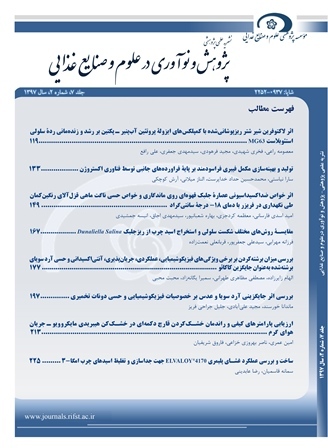 نتایج حاصل از بررسی فعالیت آنتی‌اکسیدانی نشان داد که با افزایش زمان، فعالیت ضدرادیکالی و مقدار فنول کل در نمونه‌ها افزایش یافت و همبستگی معنی‌داری بین میزان فنول و فعالیت ضدرادیکالی مشاهده گردید (0/05>P). تجزیه‌وتحلیل حرارتی نمونه نشان‌دهندۀ پایداری حرارتی بالای آرد سویای برشته می‌باشد. نتایج ارزیابی حسی نشان داد نمونۀ آرد برشته‌شده برای 8 دقیقه را به لحاظ پذیرش کلی، قابل مقایسه با پودر کاکائو می‌باشد. Alvarado, J.D., & Aguilera, J.M. 2001. Methods for measuring physical properties in food industries. Edited by Acribia. S.A.
Amagliani, L., O’Regan, J., Kelly, A.L., & O’Mahony, J.A. 2016. Physical and flow properties of rice protein powders. Journal of Food Engineering, 190:1-9. Anderson, J.W., & Major, A.W. 2002. Pulses and lipaemia, short-and long-term effect: potential in the prevention of cardiovascular disease. British Journal of Nutrition, 88(S3):263-271. Anderson, K.A. 1996. Micro-digestion and icp-aes analysis for the determination of macro and micro elements in plant tissues. Atomic Spectroscopy, 17(1):30-33. AOAC. 2003. Official methods of analysis. 17th Edition, The Association of official analytical chemists, 2nd revision. Gaithersburg, MD, USA. Methods 925.10, 945.39, 942.05 and 920.87. Arjmandi, B.H., & Smith, B.J. 2002. Soy isoflavones’ osteoprotective role in postmenopausal women: mechanism of action. The Journal of Nutritional Biochemistry, 13(3):130-137. Aulton, M.E., & Taylor, K.M. 2013. Aulton's pharmaceutics: the design and manufacture of medicines. Elsevier Health Sciences. Baba, W.N., Rashid, I., Shah, A., Ahmad, M., Gani, A., Masoodi, F., Wani, I.A., & Wani, S. 2016. Effect of microwave roasting on antioxidant and anticancerous activities of barley flour. Journal of the Saudi Society of Agricultural Sciences, 15(1):12-19. Barbosa-Cánovas, G.V., Ortega-Rivas, E., Juliano, P., & Yan, H. 2005. Bulk properties. Food Powders: Physical Properties, Processing and Functionality. P. 55-90. Food Engineering Series. Springer. Bekedam, E.K., Schols, H.A., Caemmerer, B., Kroh, L. W., van Boekel, M.A.J.S., & Smit, G. 2008. Low molecular weight melanoidins in coffee brew. Journal of Agriculture and Food Chemistry, 56(11):4060-4067. Bhathena, S.J., & Velasquez, M.T. 2002. Beneficial role of dietary phytoestrogens in obesity and diabetes. The American Journal of Clinical Nutrition, 76(6):1191-1201. Blois, M. 1958. Antioxidant determination by use of free radical stable. Nature, 181:1191-1201. Borrelli, R.C., Visconti, A., Mennella, C., Anese, M., & Fogliano, V. 2002. Chemical characterization and antioxidant properties of coffee melanoidins. Journal of Agriculture and Food Chemistry, 50(22):6527-6533. Carr, R. L, 1965. Evaluating flow properties of solids. Chemical Engineering, 18:163-168. Chen, J.K., Chen, T.T., & Crampton, L. 2004. Chinese medical herbology and pharmacology. Art of Medicine Press City of Industry, CA, 1267. Cuvelier, M. E., Richard, H., & Berset, C. 1992. Comparison of the antioxidative activity of some acid-phenols: structure-activity relationship. Bioscience, Biotechnology and Biochemistry, 56(2):324-325. Del Castillo, M.D., Ames, J.M., & Gordon, M.H. 2002. Effect of roasting on the antioxidant activity of coffee brews. Journal of Agriculture and Food Chemistry, 50(13):3698-3703. Dewanto, V., Wu, X., Adom, K.K., & Liu, R.H., 2002. Thermal processing enhances the nutritional value of tomatoes by increasing total antioxidant activity. Journal of Agriculture and Food Chemistry, 50(10):3010-3014. Díaz-Batalla, L., Widholm, J.M., Fahey, G.C., Castaño-Tostado, E., & Paredes-López, O. 2006. Chemical components with health implications in wild and cultivated Mexican common bean seeds (phaseolus vulgaris L.). Journal of Agriculture and Food Chemistry, 54(6):2045-2052. Hausner, H.H. 1967. Friction conditions in a mass of metal powder. International Journal of Powder Metall, 3(4):7-13. Fallico, B., Arena, E., & Zappala, M. 2003. Roasting of hazelnuts. Role of oil in colour development and hydroxymethylfurfural formation. Food Chemistry, 81(4):569-573. Fitzpatrick, J.J., Barringer, S.A., & Iqbal, T. 2004a. Flow property measurement of food powders and sensitivity of Jenike’s hopper design methodology to the measured values. Journal of Food Engineering, 61(3):399-405. De Freitas Eduardo, M., & da Silva Lannes, S.C. 2007. Use of texture analysis to determine compaction force of powders. Journal of Food Engineering, 80(2):568-572. Hwang, H., Hartman, T.G., & Ho, C. 1995. Relative reactivities of amino acids in pyrazine formation. Journal of Agriculture and Food Chemistry, 43(1):179-184. Jaramillo-Flores, M.E., González-Cruz, L., Cornejo-Mazon, M., Dorantes-Alvarez, L., Gutierrez-Lopez, G.F., & Hernandez-Sanchez, H. 2003. Effect of thermal treatment on the antioxidant activity and content of carotenoids and phenolic compounds of cactus pear cladodes (opuntia ficus-indica). Food Science and Technology International, 9(4):271-278. Jayaprakasha, G.K., Girennavar, B., & Patil, B.S. 2008. Radical scavenging activities of Rio Red grapefruits and sour orange fruit extracts in different in vitro model systems. Bioresource Technology, 99(10):4484-4494. Jitngarmkusol, S., Hongsuwankul, J., & Tananuwong, K. 2008. Chemical compositions, functional properties, and microstructure of defatted macadamia flours. Food Chemistry, 110(1):23-30. Kim, H.G., Kim, G.W., Oh, H., Yoo, S.Y., Kim, Y.O., & Oh, M.S., 2011. Influence of roasting on the antioxidant activity of small black soybean (glycine max l. merrill). LWT-Food Science and Technology, 44(4):992-998. Kim, E.H.J., Chen, X.D., & Pearce, D. 2005. Effect of surface composition on the flowability of industrial spray-dried dairy powders. Colloids and Surfaces B: Biointerfaces, 46(3):182-187. Kim, M.-J., & Kim, K.-S. 2005. Functional and chemical composition of Hwanggumkong, yakong and huktae. Korean Journal of Food and Cookery Science, 21(6):844-849. Kornsteiner, M., Wagner, K.H., & Elmadfa, I. 2006. Tocopherols and total phenolics in 10 different nut types. Food Chemistry, 98(2):381-387. Kumar, V., Kothari, S.H., & Banker, G.S. 2001. Compression, compaction, and disintegration properties of low crystallinity celluloses produced using different agitation rates during their regeneration from phosphoric acid solutions. AAPS Pharmacutical Science and Technology, 2(2):22-28. Kumazawa, S., Taniguchi, M., Suzuki, Y., Shimura, M., Kwon, M.S., & Nakayama, T. 2002. Antioxidant activity of polyphenols in carob pods. Journal of Agricultural and Food Chemistry, 50(2):373-377. Lee, J.H., Hwang, C.E., Lee, B.W., Kim, H.T., Ko, J.M., Baek, I.Y., Ahh, M.J., Lee, H.Y., & Cho, K.M. 2015. Effects of roasting on the phytochemical contents and antioxidant activities of korean soybean (glycine max l. merrill) cultivars. Food Science and Biotechnology, 24(5):1573-1582. Lee, J.H., Lee, B.W., Kim, B., Kim, H.T., Ko, J.M., Baek, I.Y., Seo, W.T., Kang, Y.M., & Cho, K.M. 2013. Changes in phenolic compounds (isoflavones and phenolic acids) and antioxidant properties in high- protein soybean (glycine max l., cv. saedanbaek) for different roasting conditions. Journal of Korean Society for Applied Biological Chemistry, 56(5):605-612. Lee, S., & Lee, J. 2009. Effects of oven-drying, roasting, and explosive puffing process on isoflavone distributions in soybeans. Food Chemistry, 112(2):316-320. Lee, K.G., & Shibamoto, T. 2002. Toxicology and antioxidant activities of non-enzymatic browning reactions products. Food Review International, 18(2-3):151-175. Lemos, M.R.B., de Almeida-Siqueira, E.M., Arruda, S.F., & Zambiazi, R.C. 2012. The effect of roasting on the phenolic compounds and antioxidant potential of baru nuts [dipteryx alata vog.]. Food Research International, 48(2):592-597. Li, H., Wang, X., Li, Y., Li, P., & Wang, H. 2009. Polyphenolic compounds and antioxidant properties of selected china wines. Food Chemistry, 112(2):454-460. Lima, A.R., Pereira, R.G.F.A., Abrahão, S.A., Duarte, S.M.D.S., & Paula, F.B.D.A. 2010. Coffee bioactive compounds: in vitro antioxidant activity of green and roasted coffees before and after decaffeination. Química Nova, 33(1):20-24. Liu, L.X., Marziano, I., Bentham, A.C., Litster, J.D., White, E.T., & Howes, T. 2008. Effect of particle properties on the flowability of ibuprofen powders. International Journal of Pharmaceutics, 36(1-2):109-117. Mcleod, G., & Forcen, M., 1992. Analysis of volatile components derived from the carob bean ceratonia siliqua. Phytochemistry, 31(9):3113-3119. Maillard, M.N., Soum, M.H., Boivin, P., & Berset, C. 1996. Antioxidant activity of barley and malt: relationship with phenolic content. LWT-Food science and Technology, 29(3):238-244. Martínez, R., Torres, P., Meneses, M.A., Figueroa, J.G., Pérez-Álvarez, J.A., & Viuda-Martos, M., 2012. Chemical, technological and in vitro antioxidant properties of mango, guava, pineapple and passion fruit dietary fibre concentrate. Food Chemistry, 135(3):1520-1526. Meursing, E.H. 1983. Cocoa powder for industrial processing 3rd ed. P. 126. Dezaen B.V: The Netherlands Cocoa Fabriek. Mhaisen, A. 1991. Carob tree. Agricultural Engineer, 43:90-91. Muzaffar, Kh., & Kumar, P. 2016 .Moisture sorption isotherms and storage study of spray dried tamarind pulp powder. Powder Technology, 291:322-327. Narayana, K., & Rao, M.N. 1984. Effect of partial proteolysis on the functional properties of winged bean (psophocarpus tetragonolobus) flour. Journal of Food Science, 49(3):944-947. Ndidi, U.S., Ndidi, C.U., Olagunju, A., Muhammad, A., Billy, F.G., & Okpe, O. 2014. Proximate, antinutrients and mineral composition of raw and processed (boiled and roasted) Sphenostylis stenocarpa seeds from southern kaduna, northwest nigeria. ISRN Nutrition, 2014: 1-9. Nicoli, M.C., Anese, M., Manzocco, L., & Lerici, C.R. 1997. Antioxidant properties of coffee brews in relation to the roasting degree. LWT-Food Science and Technology, 30(3):292-297. Oboh, G., Ademiluyi, A.O., & Akindahunsi, A.A. 2010. The effect of roasting on the nutritional and antioxidant properties of yellow and white maize varieties. International Journal of Food Science & Technology, 45(6):1236-1242. Odoemelam, S.A. 2005. Functional properties of raw and heat processed jackfruit (artocarpus heterophyllus) flour. Pakistan Journal of Nutrition, 4(6):366-370. Olatidoye, O.P., Sobowale, S.S., Akinlotan, J.V., & Olorode, O.O. 2011. Chemical composition and physicochemical characteristics of tropical Almond nuts (Terminalia Catappia L) cultivated in South West Nigeria. Journal of Medical and Applied Biosciences, 1(1):1-10. Petit, M.D., & Pinilla, J.M. 1995. Production and purification of a sugar syrup from carob pods. LWT - Food Science and Technology, 28(1):145-152. Rakić, S., Povrenović, D., Tešević, V., Simić, M., & Maletić, R. 2006. Oak acorn, polyphenols and antioxidant activity in functional food. Journal of Food Engineering, 74(3):416-423. Randhir, R., Kwon, Y-I., & Shetty, K. 2008. Effect of thermal processing on phenolics, antioxidant activity and health-relevant functionality of select grain sprouts and seedlings. Innovative Food Science & Emerging Technologies, 9(3):355-364. Rice-Evans, C.A., Miller, N.J., & Paganga, G. 1996. Structure-antioxidant activity relationships of flavonoids and phenolic acids. Free Radical Biology and Medicine, 20(7):933-956. Sacchetti, G., Di Mattia, C., Pittia, P., & Mastrocola, D. 2009. Effect of roasting degree, equivalent thermal effect and coffee type on the radical scavenging activity of coffee brews and their phenolic fraction. Journal of Food Engineering, 90(1):74-80. Sahin, H., Topuz, A., Pischetsrieder, M., & Ozdemir, F. 2009. Effect of roasting process on phenolic, antioxidant and browning properties of carob powder. European Food Research and Technology, 230(1):155. Shah, R.B., Tawakkul, M.A., & Khan, M.A. 2008. Comparative Evaluation of flow for pharmaceutical powders and granules. AAPS Pharmacutical Science and Technology, 9(1):250-258. Sharma, P., & Gujral, H.S. 2011. Effect of sand roasting and microwave cooking on antioxidant activity of barley. Food Research International, 44(1):235-240. Singleton, V.L., & Rossi, J.A. 1965. Colorimetry of total phenolics with phosphomolybdic-phosphotungstic acid reagents. American journal of Enology and Viticulture, 16(3):144-158. Teunou, E., Fitzpatrick, J.J., & Synnott, E.C. 1999. Characterisation of food powder flowability. Journal of Food Engineering, 39(1):31-37. The International Cocoa Organization (ICCO). Visited in October 17, 2017. Production, Grindings, Supply & Demand Statistics 2014. Available onlilie at: http://www.icco.org/statistics/ production-and-grindings/production.html. Turan, D., Capanoglu, E., & Altay, F. 2015. Investigating the effect of roasting on functional properties of defatted hazelnut flour by response surface methodology (RSM). LWT-Food Science and Technology, 63(1):758-765. Turkmen, N., Sari, F., & Velioglu, Y.S., 2005. The effect of cooking methods on total phenolics and antioxidant activity of selected green vegetables. Food Chemistry, 93(4):713-718. Vissotto, F.Z., Jorge, L.C., Makita, G.T., Rodrigues, M.I., & Menegalli, F.C. 2010. Influence of the process parameters and sugar granulometry on cocoa beverage powder steam agglomeration. Journal of Food Engineering, 97(3):283-291. Wang, Y., Chung, D.S., & Spillman, C.K. 1995. Physical Properties of Soybean Meal. Cereal Chemistry, 72(6):523-526. Xu, B.J., & Chang, S.K.C. 2007. A comparative study on phenolic profiles and antioxidant activities of legumes as affected by extraction solvents. Journal of Food Science, 72(2):159-166. Yağcı, S., & Göğüş, F. 2008. Response surface methodology for evaluation of physical and functional properties of extruded snack foods developed from food-by-products. Journal of Food Engineering, 86(1):122-132. Yousif, A.K., & Alghzawi, H.M. 2000. Processing and characterization of carob powder. Food Chemistry, 69(3):283-287. Yu, J., Ahmedna, M., & Goektepe, I. 2007. Peanut protein concentrate: production and functional properties as affected by processing. Food Chemistry, 103(1):121-129. Zyzelewicz, D., Krysiak, W., Nebesny, E., & Budryn, G. 2014. Application of various methods for determination of the color of cocoa beans roasted under variable process parameters. European Food Research and Technology, 238(4):549-563.